It's amazing what a few simple words can do to your heart. Carefully chosen ones can transform a tightly closed bud into a blooming beauty. But a few ill-timed words or ones spoken out of haste can build barriers capable of keeping any inquisitive intruder out. And out for a long, long time. But what often happens in those instances is that, in an attempt to make our friends feel better, what we've actually done is discounted all the pain and struggle they are enduring, and replaced it with a just-add-water-and-be-done sort of solution. What we've done is tried to make sense of it in our own minds and attempt to fix it how we, from the outside looking into the epicenter, feel the problem could be alleviated. What we've done is neglected to validate that the circumstance our friend is in is hard and tricky and confusing and life-changing and faith-shaking. And when we neglect to validate, we give an air of something most of us would never want to give - an air of superiority. And that type of air will always suffocate. As with pretty much any aspect of life, looking to the example of Jesus Himself can give some clarity on how we should approach this subject of empathizing/sympathizing with and validating our friends who find themselves in the wild throes of life. In John chapter 11 we see Jesus in the company of two women who were very dear to him, and these women were freshly mourning the loss of their brother, Lazarus. Now, even on earth Jesus possessed omniscience. He had knowledge of everything that was, and is, and is to come. Jesus knew full well that shortly after meeting up with Mary and Martha and being taken to Lazurus's grave, that He would raise Lazarus from the dead. He knew that the sisters' mourning would turn into laughter in mere moments. He knew. But, when Mary ran up to Him, tears streaming down her face, do you know what He did? Jesus didn't scold Mary for not having enough faith or for not coming to get Him sooner. He didn't remind her that in Him there is no real death, only delay until eternity. He didn't tell her that losing Lazarus would make her stronger and that she should be thankful that she had her brother for the time that she did. No. Even the God-Man with implicit knowledge of the workings of the universe wept when His dear friend wept. That's huge. Maybe this should be our reaction too. Not that I'm encouraging fake tears and insincere hugs and a wide combination of cookie-cutter, drippy, sappy, hallmark-card words. No, no. What I'm saying is, instead of approaching a friend with an immediate solution or a trite comfort-esque phrase, put yourself in that person's shoes. And not just the shoes, but the socks and jeans and sweatshirt as well. And imagine exactly what your friend, with all the different aspects of her life and personality, must be feeling in the midst of this heartache. And go up to her, with arms open wide, and admit that you don't really know what to say but that you are so sorry she is facing this. Tell her you wish you could take it away but instead, you offer her a shoulder to cry on, a listening ear, and many, many prayers. Validate her in her situation and all the feelings and emotions and questions she is undoubtedly facing. And feel comfortable sitting with her in silence or walking away after giving her hand a gentle squeeze. Bottom line: be ok with not fixing it. Because you can't. And even the Man who could decided that the best thing to do in the moment, was to weep. And in weeping, we validate our friend and show them how deeply we really do love. 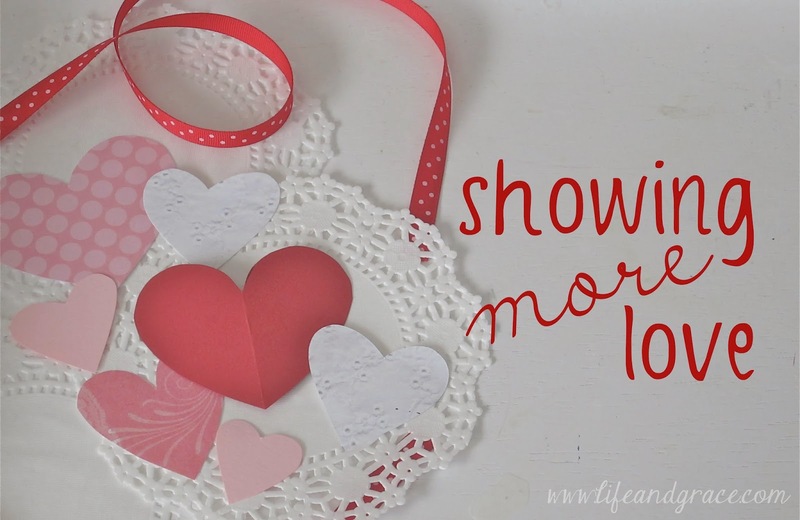 This will be the last post in the Showing More Love series. Thank you so much to those who contributed and to those who followed along. I hope it has challenged us all to think a bit more about how we can show more love in our relationships. I know it definitely has for me. It's pretty amazing how not saying something is the key ... definitely counterintuitive, but so, so important.